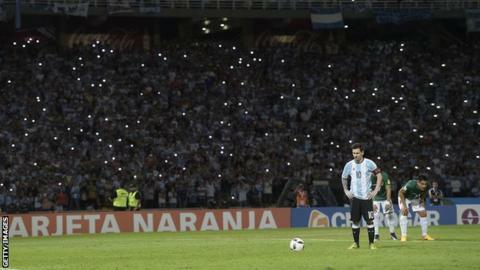 Lionel Messi closed in on Gabriel Batistuta's goals record for Argentina as he scored his 50th for his country. Barcelona forward Messi, 28, brought up his half-century from the penalty spot as Argentina beat Bolivia 2-0 in a qualifier for the 2018 World Cup. It leaves him just six goals short of former Fiorentina and Roma striker Batistuta's tally of 56. "I'm happy with goal number 50 but more because we won and this helps to keep growing," said Messi. Five-time Ballon d'Or winner Messi is Barcelona's all-time leading goalscorer with 449 goals in all competitions. He could get his 500th career goal when Barcelona meet arch-rivals Real Madrid in La Liga on Saturday.